I visited a friend in Santa Barbara this past weekend and while I was checking out her newly renovated kitchen, I noticed a stack of beautiful ethnic-print linen napkins, folded neatly on a drinks tray. My first thought was, wow, what a nice touch! I picked up the napkins to closer inspect them and suddenly realized that I had actually given them to her last Christmas! Well done, me! 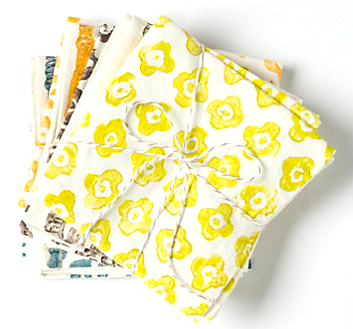 This experience made me think that pretty print napkins would be a good place to start for the home edition of my gift edit. Here are a few other fun finds that would go over well in any home: a seriously stylish photographic print from Scott Schuman (a.k.a. The Sartorialist)--for $40, no less! ; or for the high-brow art lovers in your life, an iconic yet very affordable fine art print from painter Yves Klein); a vanity-defining glamorous brass bauble box from Kelly Wearstler; a gorgeous malachite bowl (I've given out a few as gifts!) from Chic Shop; and a chic Southwest-inspired patchwork print throw. All good things! Amazing finds. Keep the home decor posts coming pretty please.